photo courtesy of SIEMENS TS. 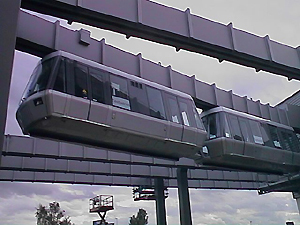 Siemens added another operational monorail to their resume when Düsseldorf Airport opened their Sky Train system in 2002. The monorail is based upon the same technology used at Dortmund University. Built to drastically reduce the amount of automobile traffic to the airport, the monorail line connects two airport terminal stations with a rail station on a heavily traveled Düsseldorf-Duisburg railway line. A parking lot also has a station along the route. Like Dortmund, the system is totally automated. Traveling a top speed of 50 kph, time from rail station to terminals is around 5 minutes.